This is the embellished version of the best-selling and award-winning historical mystery novel by Jim Musgrave. 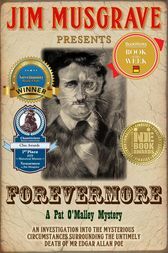 Forevermore contains the full audiobook version read by the voice of Pat O'Malley, Shandon Loring, as well as a music playlist wherein you can choose the tracks to accompany your reading experience. In addition, this title also gives you links to Edgar Allan Poe historical material and videos and even exciting video games by Big Fish Games that are based on Poe works. See why reading an Embellisher(TM) ePub3 book is the newest and best way to experience reading.